The Windows USB/DVD Download tool (don not get confused with the name it works flawless with all Windows 8 versions) allows you to create a copy of your Windows 8 ISO file on a USB flash drive or a DVD. To create a bootable DVD or USB flash drive, download the ISO file and then run the Windows 7 USB/DVD Download tool. Once this is done, you can install Windows 8 directly from the USB flash drive or DVD. The ISO file contains all the Windows 8 installation files combined into a single uncompressed file. When you download the ISO file, you need to copy it to some medium in order to install Windows 8. This tool allows you to create a copy of the ISO file to a USB flash drive or a DVD. 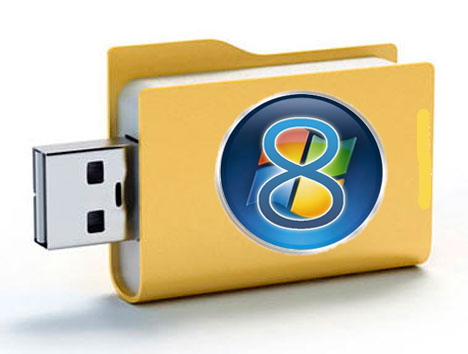 To install Windows 8 from your USB flash drive or DVD, all you need to do is insert the USB flash drive into your USB port or insert your DVD into your DVD drive and run Setup.exe from the root folder on the drive. Note: You cannot install Windows 8 from the ISO file until you copy it to a USB flash drive or DVD with the Windows USB/DVD Download tool and install from there. The copy of the ISO file that the Windows USB/DVD Download tool creates is bootable. Bootable media allows you to install Windows 8 without having to first run an existing operating system on your machine. If you change the boot order of drives in your computer’s BIOS, you can run the Windows 8 installation directly from your USB flash drive or DVD when you turn on your computer. Please see the documentation for your computer for information on how to change the BIOS boot order of drives. Follow the steps in the setup dialogs. You’ll have the option to specify where to install the Windows USB/DVD Download tool and whether to create shortcuts on your Start Menu or Windows Desktop. You need to be an administrator on the computer you are installing the Windows USB/DVD Download tool on. Before you run the Windows USB/DVD Download tool, make sure that you have downloaded the Windows 8 ISO file to your hard drive. Click the Windows Start button, and click Windows 7 USB/DVD Download tool in the All Programs list to open the Windows USB/DVD Download tool. In the Source File box, type the name and path of your Windows 8 ISO file, or click Browse and select the file in the Open dialog box. When your Windows 8 ISO file is copied onto your chosen media, you can install Windows 8 by navigating to the root of your DVD or USB flash drive and double-clicking Setup.exe.